If you are white and live in America, President Barack Obama and the race baiters know you are GUILTY of something. And you should be ashamed. Simply by existing, you are racist. And if you’re Christian, oppose gay marriage, and own a gun? You’re racist multiple times over. 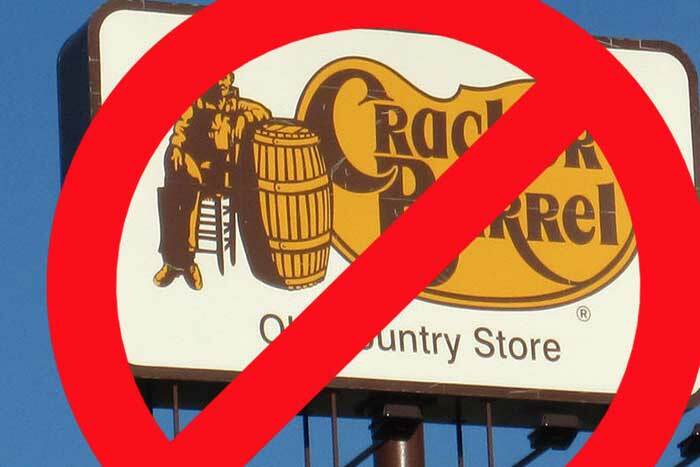 Ryan Koch from Des Moines, IA knows this, which is why he launched a HILARIOUS petition on Change.org which demands the popular restaurant chain Cracker Barrel to change its name to… CAUCASIAN BARREL. That’s because in today’s politically correct world, we must stay away from racial stereotypes in names. Just like the left is angry about the Washington “Redskins,” Ryan is going to battle for caucasians at this delicious family restaurant. I say all of us European Americans start protesting C****er Barrel. It uses an offensive slur and it is deeply offensive and mocks our long and proud heritage. The name is offensive, their logo stereotypes European Americans as people who sit on chairs and lean against what appears to be a bourbon barrel, claiming we are all a bunch of alcoholics. Sure, they’ll SAY it’s a “cracker” barrel but everyone knows crackers don’t come in barrels, they come in bags and boxes! Change the name C****er Barrel to Caucasian Barrel. After all, white people should have something to be offended by, too!